Flashback: On Feb 11, 1979, after prolonged demonstrations against the U.S.-backed shah, the army proclaimed itself neutral and the revolutionaries announced their victory. Ayatollah Ruhollah Khomeini, recently returned from exile, became supreme leader. Flash forward: The Trump administration portrays the Iranian regime as doomed to collapse — possibly quite soon. President Trump tweeted today that the revolution “has produced only 40 years of failure.” But opinions are mixed as to how many landmark anniversaries remain in its future. Politics haven’t seem a similar transformation, but as the New Yorker’s Robin Wright said at a recent Council on Foreign Relations (CFR) event, “Today you have a multi-party, a multi-factional state with very deep divisions” at the top and frequent popular protests. 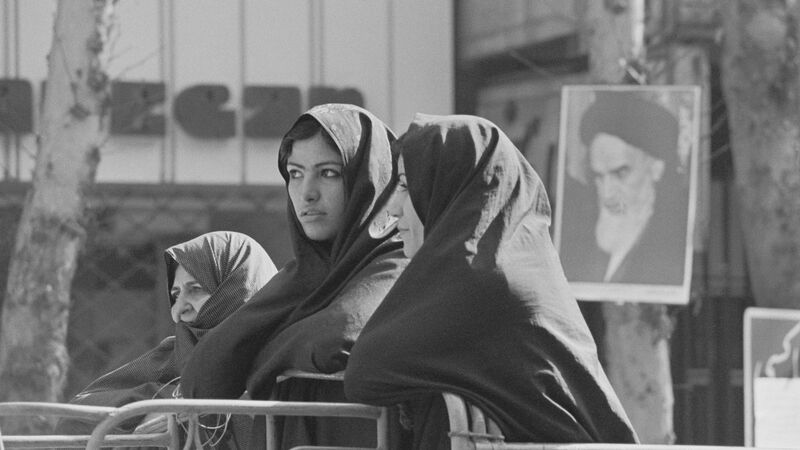 Shadows of 1979: Wright, also a fellow at the Wilson Center, noted a palpable sense that “the revolution is fraying” as the revolutionary generation ages and Iran’s leaders show a “lack of imagination in solving the problems” facing the people. What to watch: Ayatollah Ali Khamenei, Khomeini’s successor, will celebrate two milestones of his own in the coming months — his 80th birthday and the 30th anniversary of his rule. There’s no clear succession plan should that reign end abruptly, but Wright noted that the U.S.’ decision to abandon the 2015 nuclear deal risks “influencing public sentiment” in favor of a hardliner. In the meantime, U.S. sanctions will deepen an economic crisis that has already yielded shortages of medicine and food, per Oxford Analytica. 2. North Macedonia: "We caught the last train"
Signs referring to the government of Macedonia came down today in Skopje as the country transitions to its new name: North Macedonia. Axios contributor Barak Ravid reports that two years of tension between Israel and the UAE, 2010-2012, began when the proposed sale of sophisticated drones to the kingdom by a private Israeli company broke down. Between the lines: The deal was only possible because of a secret anti-Iran alliance. Prime Minister Benjamin Netanyahu was briefed on it after taking office, and he approved. The UAE even made a down payment of tens of millions of dollars. But then trouble started. The Israeli Ministry of Defense was notified at a late stage and refused to approve the deal over concerns about giving sensitive technology to the UAE, and because of U.S. reservations about the deal. When the deal was canceled, the UAE government, especially its de facto ruler Mohammed Bin Zayed (MBZ), was furious. Dan Shapiro, who was the Middle East director at the National Security Council at the time, told Barak that MBZ felt betrayed by the Israelis and it took two years of talks to end the crisis. Go deeper: Read the full report. Princess Ubolratana was selected to run by a party linked to former Prime Minister Thaksin Shinawatra in an audacious bid to break the military’s hold on power. The royals have historically steered clear of politics and, under the country’s laws, can’t even be insulted. Though Princess Ubolratana technically renounced her royal titles after marrying an American, she remains linked to the family. She’s a popular and glamorous figure who has starred in films and performed with pop stars, per the BBC. Her unlikely bid ended after the palace said it would defy “the nation's traditions, customs and culture.” Thailand’s electoral commission today released a list of candidates for the March 24 election, and the princess wasn’t on it. The big picture: This will be the first election since current Prime Minister Prayuth Chan-ocha overthrew the democratically elected government in 2014. Turkey denounced China's mass incarceration of Muslims as “a great shame for humanity” on Saturday, a rare rebuke "from a government in the Muslim world," per WSJ. The statement followed reports of the death of Abdurehim Heyit, a renowned Uighur poet and musician and one of the up to 1 million Muslims detained in Xinjiang. Then things took a strange turn. China released a video it said showed Heyit alive and demanded an apology from Turkey. Between the lines: Claims immediately came in saying the video was doctored, according to the BBC. The frightening reality is we now live in a world where even video evidence can't be trusted. The big picture: Assuming Heyit is alive, he's still being held against his will along with hundreds of thousands of other Uighurs. Turkey's statement seems less out of place than the general silence on this issue from much of the world. Advanced economies: South Korea (95%), Israel (88%), U.S. (81%), France (75%), Japan (66%), Canada (66%), Russia (59%). Emerging economies: South Africa (60%), Brazil (60%), Mexico (52%), Tunisia (45%), Nigeria (39%), India (24%). The age gap: In Indonesia, 66% of 18- to 35-year-olds own cell phones, compared to just 13% of those 50+. The gap is also huge in developed countries like Poland (93% vs. 35%). In the U.S. it's 95% vs. 67%. The trend: Across the emerging economies, smartphone ownership has jumped from 18% to 47% over the past five years, while mobile phone ownership has virtually held steady at 80%. — Saudi Foreign Minister Adel al-Jubeir, when asked on CBS' "Face the Nation" where Jamal Khashoggi's body is. Khashoggi was killed by Saudi agents 133 days ago. Thanks for reading — see you Thursday evening!